I’m usually a beer and wine drinker, but back in May, my first stop in Nashville with my friends Ben Martin of Online Community Results and Teri Carden of ReviewMyAMS.com was at Rumours Wine Bar in the Gulch neighborhood. It was happy hour so a selection of cocktails were $5 or $6. 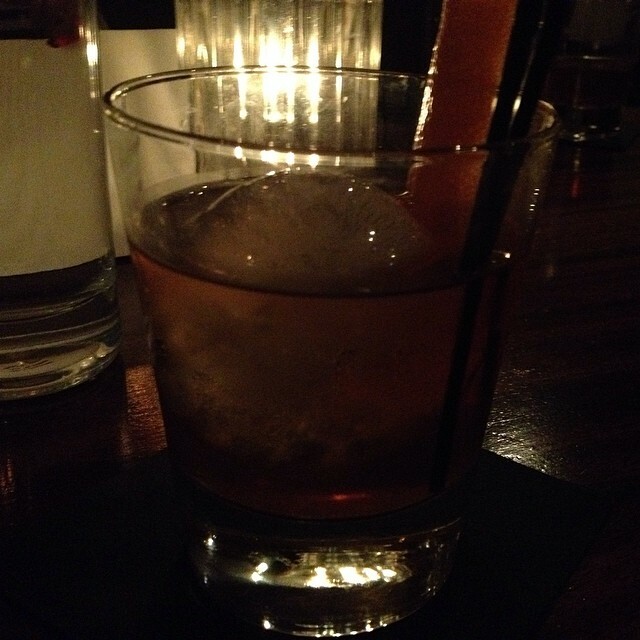 Ben recommended the Old Fashioned — a very fine choice. We were heading elsewhere for dinner, but we split two small plates of snacks, including the Shishito peppers. In August, try this link (it’s not live yet) on the Nashville Lifestyles website for their Rumour of the Month food and drink pairing suggestions. The next night, I went to the Patterson House with the Nashville CVC ladies. When we got out of the car, I wondered where we were heading because I didn’t see anything resembling an entrance to a nice bar. But we walked up some steps to a non-descript entrance and went in. The hostess led us past a heavy red velvet curtain into a dimly lit room with a speakeasy atmosphere, not that I’d know what that is. The chandeliers and lamps look like they came out of your elegant grandmother’s attic. Booths and bookcases line the perimeter of the room. And, in the middle, a 30-seat bar is where the bartenders create their exquisite concoctions. The bar opens at 5:00 p.m. and doesn’t take reservations. I’ve read that lines are common so go early. Their extensive cocktail menu is organized by spirit. If you can’t decide, Ben says, “Just tell the server what kinds of flavors you like and let them make you something custom.” I had a Bacon Old Fashioned made with Benton’s bacon-infused 4 Roses bourbon, maple syrup and coffee pecan bitters. Smoky goodness chilled by a giant spherical piece of ice. Ben also recommends the Clapless Belle — “ask for it to be made with Belle Meade.” That’s a local bourbon, more on that later. We shared some tater tots, truffled devils eggs and goat cheese balls, but the best were the hot-from-the-fryer donuts sprinkled with a mix of cinnamon, sugar and salt. Nothing compared to the craft cocktail experience at the digitalNow reception at Pinewood Social. I should have taken a photo of the menu so I could tell you exactly what I drank but I didn’t. I do remember having The Bitter Wife made with Corsair gin, Batavia Arrack, lemon and Lyle’s Golden Syrup. And a Marathon Manhattan with Corsair Triple Smoke, 1776 Rye, Carpano Antica and Regan’s orange bitters. The mixologists at Pinewood, and probably at many of the other places I indulged in cocktails, are serious business about crafting the most exquisite beverages. To get a smoky aroma on another cocktail, the bartender let loose a few drops of Laphroaig single malt scotch from an eyedropper and then twirled that around the glass. Every drink had several ingredients including artisanal bitters and fruit oils. If you’re a cocktail lover, you owe it to yourself to check out Pinewood. Plus, Pinewood has more than amazing cocktails. The food was fantastic especially their Things on Toast. Try their Crispy Pork Rinds with Adobo Spice, Fried Broccoli, Lobster Roll and Fried Chicken too. While you’re there, you can stay inside and bowl on one of their six vintage lanes, or go outside to play bocce or hang out poolside. According to Ben, you might even see celebrities while you’re there. Did you notice Corsair was mentioned a few times in my descriptions of cocktails? Corsair is a distillery in Marathon Village – an old Marathon Motorworks Factory that’s been rehabbed into a four-block complex of shops and studios in the Germantown neighborhood. Corsair was our first stop the afternoon I arrived in Nashville but they were closed for a private party. You can take a tour but plan ahead – it looks like they sell out about a week ahead. I never got to try Whisper Creek Tennessee Sipping Cream which was described as similar to Bailey’s but made with aged Tennessee whiskey, not Irish whiskey. Maybe this time, I’ll have it for dessert one night, or in my coffee. Another cocktail list favorite in East Nashville is No. 308. Try one of their $5 shots named after Beat writers. Ben suggests taking a taxi to Whiskey Kitchen, it’s not far, for its dozens of bourbons and whiskeys. If you find yourself in the Germantown neighborhood, I can attest that the cocktails at Rolf & Daughters, a restaurant I will describe in a future Nashville food post, are fabulous. This is the fourth in a series of posts about Nashville for ASAE Annual Meeting attendees. Thanks to the Nashville Convention & Visitors Corporation, I received complimentary registration and accommodations during the 2014 digitalNow conference – giving me an excuse to spend more of my money on Southern food and craft cocktails.